We got some questions from readers after they watched some professional Fortnite players on stream. They asked us, what is a scrim, and what are Fortnite pro scrims? We will try to explain this in this guide. Definition: scrim is short for a scrimmage. It has its origins from online first-person shooter games, where clan wars would practice against each other in so-called scrimmages. The word was later shortened down to scrim to make it faster to type. So a scrim is just an unranked practice match in online games against other competitive players or teams. 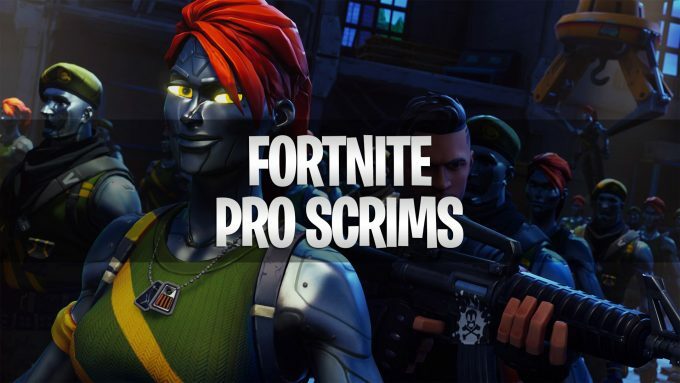 What are Fortnite pro scrims? In relation to Fortnite, a pro scrim is the same as the definition above. It is called a pro scrim because it is usually professional players who attend these. It became popular since Fortnite does not have its own matchmaking system implemented at the moment, so pro scrims are the only way for pro players to practice against other pro players. How do Fortnite scrims and pro scrims work? There are several formats, but the most popular in Fortnite is what is called snipes – this can be solo snipes, duo snipes, and squad snipes. Snipe refer to the act of all players trying to find a game at the same time in a similar way that stream sniping is done. People will usually gather in a so-called scrim Discord, pro scrim Discord servers or a ProCord. In these servers, people will join the same voice channel and the host will count down to zero and everyone will search for a game at the same time. Another format is private matches with a custom matchmaking key, but these are usually hard to get by. How do I get a custom matchmaking key? Currently, it is not possible for regular players to obtain custom matchmaking keys and thereby creating custom private matches. The only way you can practice in private matches at the moment is in the limited time mode, LTM Playground. EPIC games community members and people in charge of their esports division hand out these keys. They are typically handed out for tournaments, big streamers, and popular pro Discords and we think we will see much more private matches in the future. Currently EPIC is experimenting a lot with esports formats and how it is done best. There are many ways of doing scrims and there is no correct way of doing it. It is basically just a practice match, so it is up to the players themselves to make the rules. If you want to start scrimming yourself and improve your gameplay, we would recommend that you join some of the pro Discords. There exist many Fortnite pro Discords, and visiting the Fortnite forum “squad up” section will provide you with some of them. You can also check out this list of Fortnite pro Discords, which only contains some of the biggest and most popular though. If you decide to join some of the servers, it is important to read and understand their rules so you avoid getting kicked or banned from the servers. If you have anything to add, please feel free to leave a comment.